The ISF announced the “second phase” of operations in Mosul’s city limits, now in its second month, on December 29 after operations paused for a week from December 21 to 28 to allow ISF units to regroup and remobilize. 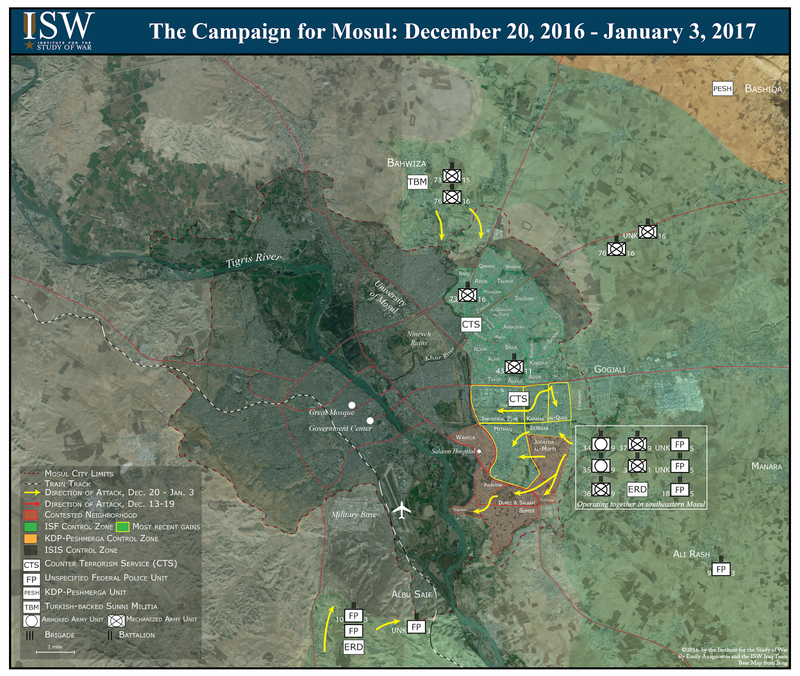 Since December 29, the ISF recaptured five major neighborhoods along Mosul’s main east-west highway and pushed further towards the eastern bank of the Tigris River. The advances inward have put the Mosul Airport and adjacent military base in range of ISF artillery. New accelerants from the ISF and Coalition made this revived push successful. Three brigades of Federal Police and units from the Emergency Response Division, an elite unit in the Ministry of Interior, redeployed from the southern axis and began operating in the southeast alongside units from the 9th Iraqi Army Armored Division. The introduction of the Federal Police into Mosul is a risk if the units are especially compromised by or comprised of pro-Iranian militias, which has historically resulted in sectarian violence, although the Coalition has previously cooperated with at least one of the three brigades in Ramadi. These reinforcements bolstered Iraqi Army efforts to retake several southeast neighborhoods from December 29 to January 3 and relieved the Counter Terrorism Service (CTS), which has shouldered the bulk of the urban warfare, the burden to both hold territory and support less-experienced ISF units. The Coalition also accelerated the advance by embedding deeper with Iraqi units. The Coalition announced on December 24 that it would embed at a lower-level in the ISF, including alongside formations, such as the Federal Police, with which the Coalition has not embedded in the past. U.S. Defense Secretary Ash Carter had announced in July, after the ISF retook the Qayyarah Airbase, that embedding U.S. advisors at brigade- and battalion- levels was one of four accelerants it would deploy as the ISF set final conditions for Mosul, however advisors continued to remain primarily at the division level. U.S. advisors are now particularly focused on supporting the northern axis, where Iraqi Army units have not yet breached the city, though the advisors are also operating alongside the CTS and other ISF units. 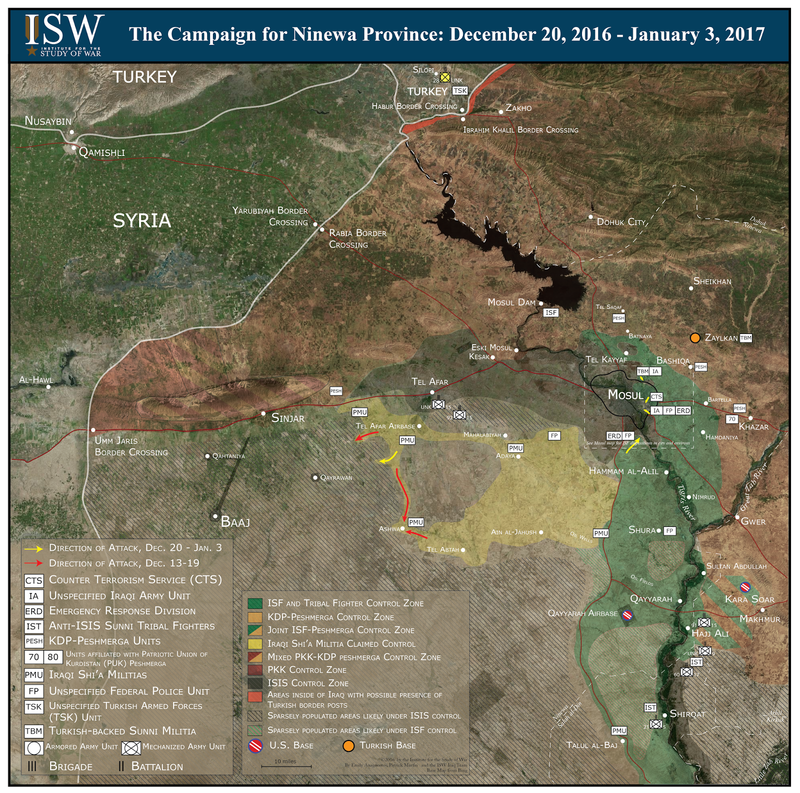 The ISF may also begin relying on increased Coalition airstrikes to counter ISIS targets, rather than door-to-door operations; this raises the risk of civilian casualties but can stave off further attrition.